DCoTEPatch unlocks extra features, adds cheats and allows modifying gameplay values. The game is unstable at frame rates above 60 FPS. See Frame rate capping methods. The GOG.com version includes various small fixes, including: proper Vsync functionality, a fix for the triangle raindrops on AMD cards, and a custom-made fix provided by user Guzz, which allows the invisible sorcerers on the reef to appear properly, plus restores skybox rendering. Bypasses a game breaking bug, allows changing FOV, skipping intro videos and more. Only the original retail executable enables all features. Delete or rename beth_logo.wmv, cocdcote_logo.wmv, hf_logo.wmv, legal.wmv, and warning.wmv. legal.wmv, and warning.wmv come with german and french variants. User will need to delete or rename them if they play in any of these languages. 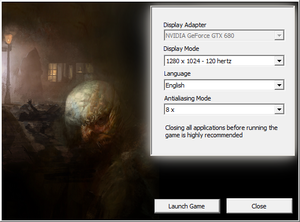 Use Call of Cthulhu Widescreen Fix or see the WSGF entry. Use DCoTEPatch. Requires starting a new game. On by default in the GOG.com version. Can be forced in the graphics card control panel. The game is unstable at frame rates above 60 FPS. Resolutions above default reduce movement speed, making the game unwinnable. Install Call of Cthulhu Widescreen Fix. By default, X is bound to "backwards" and S to "use". 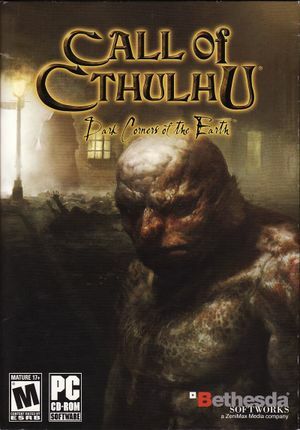 Download Call of Cthulhu Modern OS BUGFIX. Copy Resources folder to the installation folder. When you first get to use the cannon, you need to hit three targets shown as a blue light. If playing on Windows Vista or later, these targets are not visible. This fix adjusts the script, with the result being equivalent as if the sorcerers only made three waves against the ship. A blind-fire guide also exists. In the GOG.com version, fullscreen mode defaults to 60 Hz, even if the screen refresh rate is set higher than that. Open <path-to-game>\Engine\d3d9.ini or %USERPROFILE%\Documents\My Mods\SpecialK\Profiles\CoCMainWin32.exe\SpecialK.ini depending on the installation method you used. All of the issues below can be solved by capping the frame rate at 60 FPS. However, this only works for some users. When descending into the basement during the prologue, the game may crash if you don't get down fast enough. The crash can be avoided if you jump off of the ladder without touching the stairs. Be advised that this may take a few tries. In the old newspaper office, during A Visit to Old Town near the beginning of the game, there are two doors on your way out, if you take the right door you will enter a room with a woman who has hung herself. This room can sometimes glitch and will cause you to lose mobility of Jack and be unable to progress. Just skip that room as there is nothing of interest otherwise in it, take the locked door on the left, by unbolting it in the upper corner of the door. In chapter 3 (Attack of the fishmen) you will sneak through a warehouse. After crawling under the floor you will climb into an office. When you try to get to the save symbol by pushing the bookshelf the game crashes. Changes various aspects of the gameplay and adds support for cheats. Simulates HDR and bloom lighting, as well as advanced contrast for a more natural and realistic atmosphere. In-game MSAA must be disabled in order to work. Force it through graphics card control panel. ↑ 1.0 1.1 File/folder structure within this directory reflects the path(s) listed for Windows and/or Steam game data (use Wine regedit to access Windows registry paths). Games with Steam Cloud support may store data in ~/.steam/steam/userdata/<user-id>/22340/ in addition to or instead of this directory. The app ID (22340) may differ in some cases. Treat backslashes as forward slashes. See the glossary page for details. ↑ 1.0 1.1 1.2 ContributorX_PJ64 comments on This is pretty cool. Someone has been working to add widescreen support to a bunch of older games. ↑ Review on GameFAQs. Other reports indicate it is fixed in Steam version.